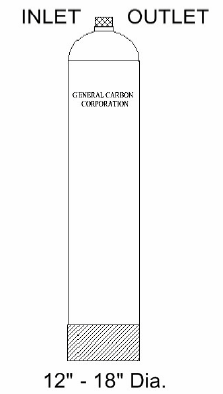 Activated Carbon Filtration | FRP-Series | General Carbon Corp. Resistant to many chemicals, General Carbon’s FRP-Series Liquid Phase Adsorbers are ideal where corrosion is a primary concern. Rated for 150 PSI these units can be used effectively in high-pressure applications. FRP vessels always have to be protected from vacuum conditions by use of a vacuum breaker in the line. The FRP-Series tanks come in many sizes to handle a full range of liquid flows. Made with an internal bladder wrapped in fiberglass, these filament wound vessels are ideal for filtration using activated carbon, resins or other filter media. Food grade internals are standard along with a wide selection of inlet/outlet sizes. Automatic valves are available for unattended or automatic backwash. 1 Flow Rate at Maximum Recommended Loading of 5 gpm/ft.2 Bed Cross Section Area. 2 Pounds of Carbon is for Density of 28 lbs./ft.3 and allowing 25% Bed Expansion for Backwash. Installation & Startup – FRP-series adsorbers are shipped empty along with the required carbon. The adsorber should be connected and all fittings pressure tested for leaks before the carbon is installed through the top access hole. A vacuum relief device is advised to prevent tank damage. After the carbon has been loaded, the unit should be filled with clean water through the bottom collector, and allowed to degas for 8-12 hours if possible. Backwashing the carbon is recommended to remove carbon fines that can cause excessive pressure drop through the unit. Maintenance – All liquid phase adsorbers work better if they are backwashed periodically. This “fluffs” up the bed removing fines and channeling flows. Additional maintenance that FRP-Series adsorbers require is the testing of effluent quality, and the checking of the operating pressure of the system. Monitoring the contaminant level into the last unit in a series arrangement is the recommended safeguard against having breakthrough in the final outflow. Servicing – Once an adsorber’s carbon is saturated by contaminants, the unit should be taken off line and fresh carbon installed. To purchase replacement carbon or to arrange for a carbon change-out, please contact our office. When preparing the unit for service, you need to drain as much water as possible from the vessel.